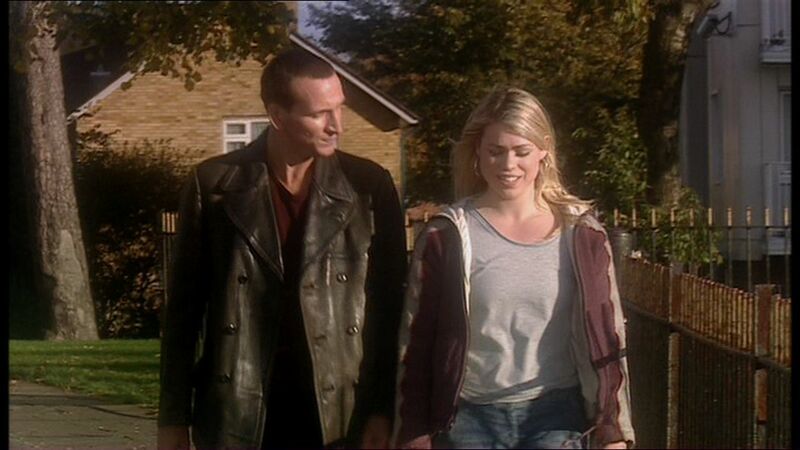 There is still debate as to where Rose, the first story from the revived Doctor Who, falls in terms of story number. Doctor Who Magazine has it as Story 157, but using the BBC calculation method (which counts the incomplete Shada as Story 149 and the season-long Trial of A Time Lord as four stories instead of DWM's count of one), it would be Story 161. I've opted to side with the BBC on this merely because I've used their numeric system throughout, although I would object to counting Shada as part of the canon up until it is released on DVD. It has been a long time (nine years in fact) since a new Doctor Who had been made (sixteen years if you count from the television series and not the television movie). Russell T. Davies, both a writer as well as a devoted Doctor Who fan, brought the series back from its "hiatus". How would he pull this off? Would you have those rubber monsters? Those "inexpensive" sets? Who would be Who? What about his Companion? How would he explain all that missing time? Tough things for anyone to answer. Fortunately for us, Doctor Who managed to not only find a brilliant writer/producer in Davies, but also first-rate talent to embody the Time Lord and his newest Associate. We begin with one Rose Tyler (Billie Piper), an ordinary working-class girl with an ordinary life. She has a job as a shopgirl, lives in what Americans would call 'the projects' with her mom Jackie (Camille Corduri) and has a boyfriend. Then comes one night, one fateful night, when everything changed. Rose goes to the basement to deliver some money, but finds herself being pursued by dummies who are alive. Just before they attack her, she is rescued by a mysterious man who identifies himself as The Doctor (Christopher Eccleston). Rose, having survived the attack and subsequent explosion of her job site, is being pursued by one of the dummies' arms. The Doctor tracks both down and soon she gets involved in both trying to find out who The Doctor is and what those things that attacked her are. Rose could not just be another Doctor Who story, because Rose serves as an introduction to a whole generation that may not have any real understanding of the Doctor Who myth. There is a good chance that many viewers have never encountered The Doctor, so in a sense Rose is the equivalent of the first Doctor Who story: An Unearthly Child. Davies' script is absolutely first-rate in introducing us not just to the title character, but to the Companion. In fact, I'd argue that Rose lives up to its name in that it is more Companion-centered than Doctor-centered. We start with an absolutely beautiful opening montage. Director Keith Boak gives us a brief overview of Rose Tyler's life at that point with virtually no dialogue (the only real spoken words were Rose saying goodbye to her mother). It isn't until Rose is in danger that we start having any actual dialogue. The pacing is also very quick but effective, packing in a lot of action, exposition, even comedy in under an hour's time. All this in complimented by Murray Gold's score (and his version of the Doctor Who theme song updates it while still making it familiar to fans of the original). All the things that a regular Doctor Who fan would know about (the TARDIS being bigger on the inside than the outside, the sonic screwdriver) are introduced in Rose effectively. This is the greatness of Rose in terms of story: all that is familiar is made new, and all that is new is made logical (well, almost all that is new). The performances of the leads are excellent. Americans would not be hostile to Billie Piper as Rose Tyler, unlike the British. From what I understand, the latter were upset at her casting because she had started out as a "pop star" (even Sixth Doctor Colin Baker expressed reservations about Piper), but since she didn't have any exposure in the States we could not hold her background against her. Instead, what we saw was Rose Tyler, an ordinary girl from the less-than-posh side of town. Her performance was sincere as someone just starting out life who gets swept up in an wildly unusual situation. Tyler may be a simple girl, but in no way simple minded. In fact, she is able to hold her own against someone as intimidating as The Doctor. Being a girl from the 90s, she wouldn't know what a Police Box would be, but she would be sharp enough to notice that the mysterious stranger spoke with a particular accent. (Side note: most Americans would not be able to place Eccleston's accent as "Northern" but more than likely they would notice he had a different manner of speech than Rose's). It should be pointed out that in the end she, not The Doctor, is the hero (or heroine) of the story. Christopher Eccleston is also brilliant as The Doctor. He instantly establishes that his Doctor is incredibly intelligent, and even manages to make his Doctor a bit funny. When The Doctor wonders what large, circular object in London could be used to signal to the dummies to attack while standing across the River Thames from the London Eye, his constant looking between the Eye and Rose without following what she was trying to tell him is, to use his terminology, 'Fantastic'. There is even a bit of pathos in his Doctor without the character going into detail. Take for example when the Doctor asks Rose to come with him. He doesn't plead, he doesn't beg, but in his voice and his face you can see the hurt in The Doctor when she first declines. The Doctor that Eccleston introduces is quite manic, one with a little bit with a chip on his shoulder and almost thoroughly unconcerned with how his actions affect others. The smaller roles are also wonderfully done. Coduri's Jackie Tyler is wonderfully comedic when she suggests that with The Doctor appearing in her room while she's in her bathrobe that "anything could happen", then looks delightfully irritated when The Doctor tells her, "No, it wouldn't". She could have come off as a bit trashy, but instead she shows herself to be someone who does love her daughter but won't shrink from taking advantage of the situations to benefit herself. Clarke's Mickey is also excellent as her thoroughly cowardly boyfriend, but when the duplicate Mickey appears, he can be quite frightening. Here are some things that I thought Rose could have handled better. First, the monsters were never mentioned by name on screen. Perhaps there were issues with using the name "Autons" because they had been created for the 1970 story Spearhead From Space. However, I see nothing wrong with giving them their name, especially considering that while the production company The Mill created wonderful special effects the producers kept the original sound of the Autons firing mechanism (a nice touch). The comedy bit involving the Doctor being strangled by an Auton's hand while Rose continues talking unawares felt flat with me: I didn't think it was funny. We also have a strange thing with Clive when he's explaining to Rose the mystery of The Doctor. We see The Doctor in pictures/drawings at three historic events: the 1883 explosion of Krakatoa, shortly before the Titanic sailed, and at President Kennedy's assassination (side note: in the picture at this event I thought he looked like Dennis Hopper). That establishes he's been around for a while, but when he looks at himself in the mirror, he comments about his ears. While this may be a touch to discuss the idea of 'regeneration', it is a little confusing in terms of chronology. Still, as it stands Rose is a wonderful entry for someone who is coming in to the world of Doctor Who as well as a welcome entry for someone who knows the long-lasting mythology. Rose, by any name, smells sweet. I was thoroughly disappointed when I saw this episode. I expected to see Betty White but did not see her! After all, she IS the most famous Rose to cone out of St. Olaf! I believe, even at age 86, SHE is the sweetest-smelling Rose of all!